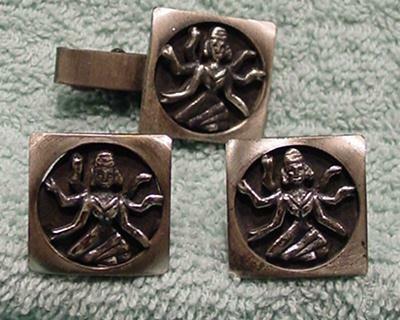 This anodized silver-tone tie clip and cuff links have the 6-armed Hindu god Shiva seated in a circular inset cutout upon a black background. One of the cuff links has some scratches in both lower corners. The tie clip also has some scratches in the lower left hand corner. 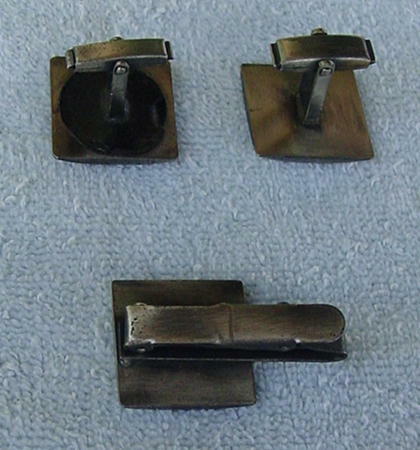 The back end of one of the cuff links has a circular black background instead of a solid anodized silver-tone finish.